LeoSat Enterprises, which is launching the fastest, most secure and widest coverage data network in the world via a constellation of low-earth-orbit satellites, announced today that it had achieved an important milestone by securing commercial agreements valued at over US$1Billion. These pre-launch agreements span a wide range of fast-growing data and mobility sectors including, Enterprise, Telecoms, Government and Finance. 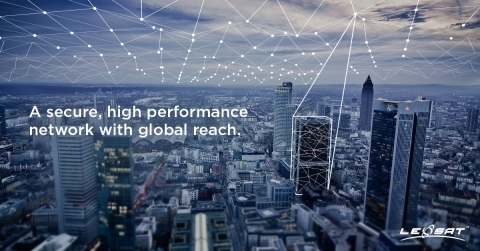 “We believe that LeoSat can truly fuel worldwide economic growth by offering our customers the fastest, most reliable and secure global infrastructure for data communications. These commercial agreements valued at over US$1Billion clearly demonstrate LeoSat’s progression from a new networking concept to a unique solution which not only resonates with our customers but has also attracted the firm backing of two leading satellite companies - SKY Perfect JSAT and Hispasat,” said Mark Rigolle, CEO of LeoSat Enterprises. LeoSat Enterprises was established to leverage the latest developments in satellite communications technologies to develop and launch a new low-earth-orbit satellite constellation which will provide the first commercially available, business grade, extremely high-speed and secure data service worldwide. With up to 108 low-earth-orbit communications satellites in the constellation LeoSat is the first company to have all the High Throughput Satellites (HTS) in the constellation interconnected through laser links, creating an optical backbone in space which is about 1.5 times faster than terrestrial fiber backbones and without the need for any terrestrial touchpoints. This unique set of features enables LeoSat to provide instant infrastructure from anywhere to everywhere which is fast, secure and reliable.